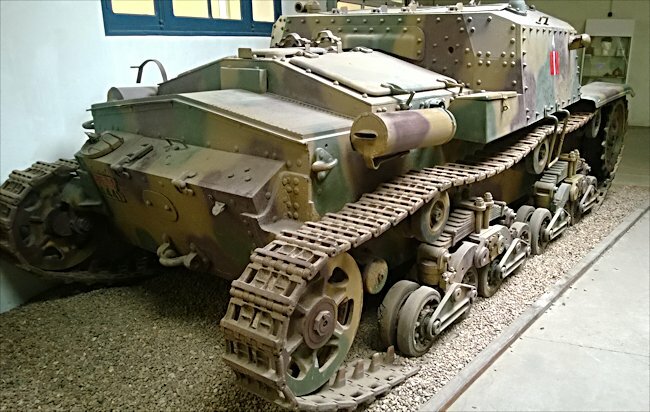 This Semovente 75/18 M40 Italian Assault Howitzer Self-propelled Gun can be found at the French Tank Museum in Saumur in the Loire Valley. The Museum is called Musée des Blindés ou Association des Amis du Musée des Blindés, 1043, route de Fontevraud, 49400 Saumur, France www.museedesblindes.fr . The word Blindés means armoured. The Italians put a 75mm howitzer mountain gun on the chassis of the infantry support tank M13/40. It was used as an infantry support vehicle when attacking bunkers and machine gun posts as well as in an anti-tank role. The M13/40 tank at this stage in the war had been out classed so it was a good way of using unwanted chassis technology. It later served with Semovente 75/34 SPGs that had longer gun barrels and used the improved tank chassis of the Carro Armato M15/42 Italian Medium Tank. It had upper front armour of 75mm thickness. The lower section was 50mm thick. The lowers sides and rear armour was only 25mm thick, The upper sides were 45mm thick. It had a top speed of 38 km/h and needed a three man crew. It had a range of 180km. It weighed 15.7 tonnes. The car company Fiat produced the tank. After the Italians surrendered in September 1943 the German army used them in the defence of Italy and renamed them Stug M42L 853(i). They were used in a combat, policing, reconnaissance and training role. 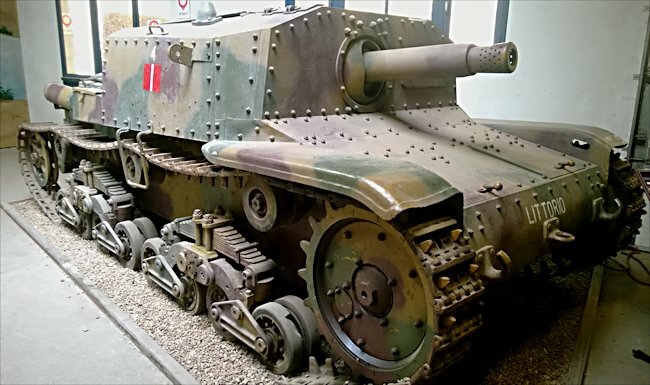 Some were produced by Fiat for the German army after the Italian surrender. Semovente M40 Assault Howitzer Italian Self-propelled Gun. To survive it had to be dug in hull down so as not to expose its weak lower armour. 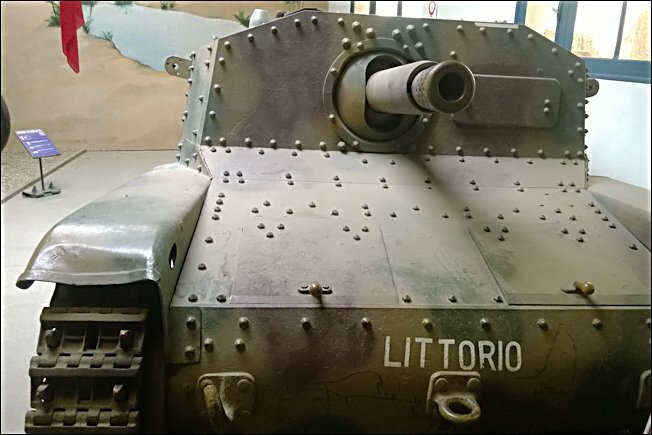 Where can I find preserved Semovente Italian Self Propelled Guns?